Something about this Concord Crush just yells ELEGANCE.. maybe its me, but I do have a crush on this Concord! I cannot tell you how many times I reach for this color. Its painful! ... so now I have to clean up all my scraps and get the color out of my face before I create, or I am telling you - its would be a "purple" jungle in this blog world place! When I made the pinky vintage card, I thought about this ... to the point where I started putting this together before I completed the other card... ugh.. this is slightly different, but same type elements. My little humming bird is popped out and layered by 2 of them, with dimensionals. It blends in here - doesn't it? This card is slightly heavier, so I would need some extra postage for this guy to be mailed... but I like him, what about you? stunning card, love the colors and I'm sure your co-worker was appreciative of the gesture. That is so gorgeous! Wonderfully done! 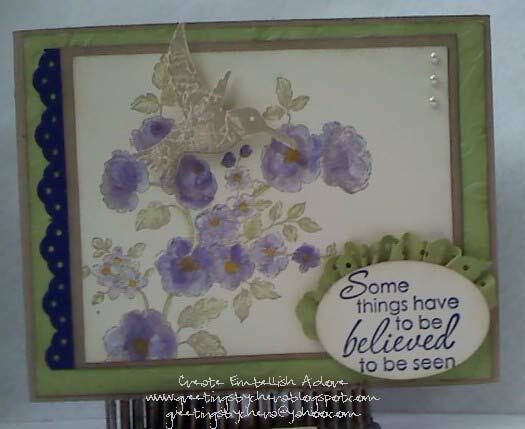 Great color combo used on your lovely card! Thanks for sharing!